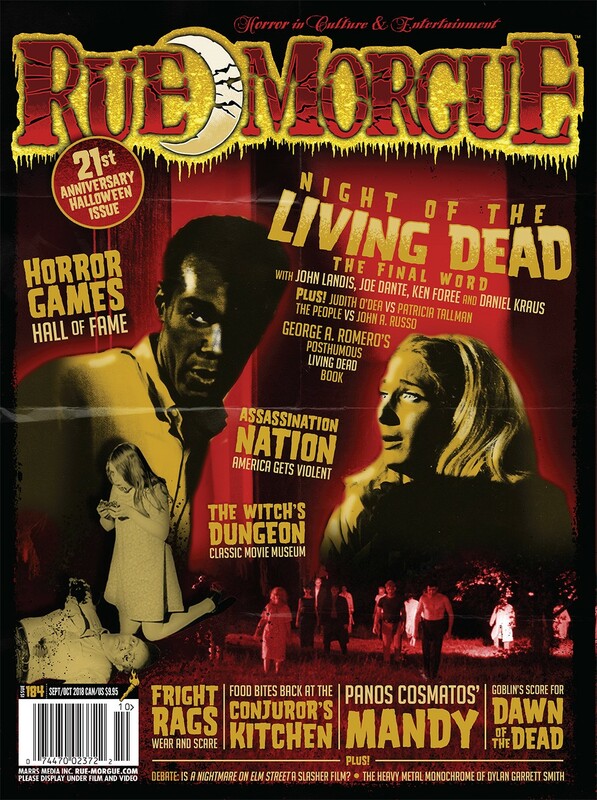 Summer is coming to a close and the scent of Halloween is in the air with the arrival of RUE MORGUE’s 21st ANNIVERSARY HALLOWEEN SPECIAL ISSUE (#184) featuring the final word on George Romero’s NIGHT OF THE LIVING DEAD. Fellow directors JOHN LANDIS and JOE DANTE, along with Romero collaborators KEN FOREE and DANIEL KRAUS, gather to discuss the importance of one of the most seminal horror films of all time. Plus! JUDITH O’DEA and PATRICIA TALLMAN re-examine Night’s controversial female; JOHN RUSSO’s ill-received 30th anniversary re-edit; Romero’s posthumous THE LIVING DEAD book and more! Also features: Rue Morgue’s HORROR GAME HALL OF FAME; Sam Levinson’s ASSASSINATION NATION; inside the WITCH’S DUNGEON CLASSIC MOVIE MUSEUM; the mind behind FRIGHT RAGS; the deadly delicacies of THE CONJUROR’s KITCHEN; Panos Cosmatos on MANDY; Bowen digs up THE EVIL; remembering THE TINGLER; EDGAR ALLAN POE’s SNIFTER OF TERROR; Maria Alexander’s SNOWBOUND; the Heavy Metal Monochrome of DYLAN GARRETT SMITH; the Homicidal Homemaker preps CHARRED REMAINS WITH BOSCO “BLOOD” BBQ SAUCE; Goblin’s score for Romero’s DAWN OF THE DEAD; VAMPYR and STATE OF DECAY 2; DEBATE: is A Nightmare on Elm Street a slasher film? All this and the latest film, book, comic book, music, game and toy releases! Save on shipping waiting time and costs with RUE MORGUE DIGITAL available NOW for iPhone, iPad, Android, PC and Mac for only $4.99 an issue! Still not in digital format. What happened? Sorry Juan, we are experiencing a technical issue but rest assured we are working on it and expect to have a resolution shortly! When will the new issue be showing up in the app? I have not seen it on either my iPad or iPhone app, but it has been on store shelves here in Richmond, va for about a week. Still not in digital. Something wrong?